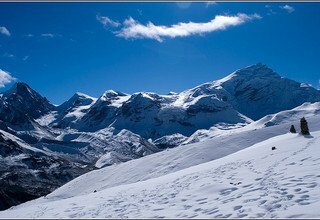 The Thorong Peak at 6,144 meters above the sea level stands tall in the Annapurna Region. Reaching Thorong peak is a glorious journey that traverses through beautiful trails along many Manages and Gurung villages, set in the lap of the Himalayas. The Thorong Peak Climbing takes us through verdant hills and into the heart of the Himalayas to offer spine-chilling adventure and ecstatic views. 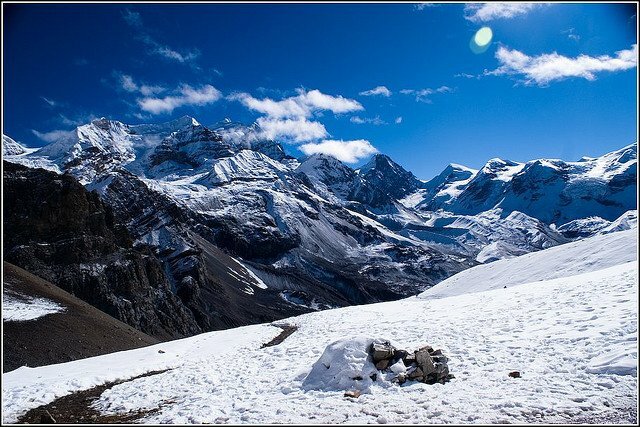 Leading us to the barren lands of Manang, we are bound to be in awe with the grandeur of the journey. Beginning in the city of Kathmandu, we head to Jagat and eventually to Pisang via Dharapani and Chame. The trail will also entail the cross to high pass of Thorong La (5416m) and witness wonderful views of mountains ranges of Manaslu, Annapurna, Dhaulagiri, and Machhapuchhre. Starting at the low lands of Lamjung along the banks of the Marsayangdi River and through dense forests, we will make our way up to the arid region of Manang and finally enter the sacred Muktinath. The region is blessed with a bounty of flora, fauna ranging from wildflowers, birds of various kinds, the mountain goats, ibexes, and the elusive snow leopard. Along with this, the region is equally known for its beauty in culture and tradition. The people living in this region have many traditions which are very unique to Nepal. It is a non-technical trek however, it can get strenuous at times due to the long hours of walks. It is recommended for people who are the good physical condition. After the successful climb, we can relish in feats of our accomplishment which almost feels like you’ve reached the top of the world. Swiss Family Treks and Expedition has been one of the pioneers in the tourism of Nepal since its inception. We offer excellent transportation and accommodation facilities with guides well-versed in English. Our client-driven services are primarily prioritized to keep the safety and comfort as the foremost concern. Namaste and welcome to Kathmandu. One of our officers will receive you from the airport and transfer you to our hotel. Overnight stay at a 3-star hotel in Kathmandu. Kathmandu valley is a home to seven UNESCO enlisted world heritage sites. Operating in a monarchical system during the medieval times, Kathmandu valley has a rich Newar history and culture with the major blend of both Hindu and Buddhism. We start off the day by visiting Pashupatinath temple and Boudhanath Stupa. Then we visit Kathmandu Durbar Square. We will end the day by visiting the Swayambhunath which offers the view of the entire valley. We will be escorted in a private vehicle and guided by an English-speaking guide during the tour today. Overnight stay at a 3-star hotel in Kathmandu. We leave early in the morning to avoid traffic as the highways are usually full of traffic. We will get a beautiful view along the way next to some fast rivers which host adventurous activities such as rafting and canoeing. We will pass the Trishuli and Marsayangdi River as we reach the village of Jagat from where we will begin our trek. Overnight stay at a lodge at Jagat. After breakfast, we will begin our journey to Dharapani. Crossing small villages with quaint settlements and moving through fields, we will reach Dharapani. There is also a waterfall along this way which very popular among locals and tourists. We pass through villages like Chyamche, Tal, and Karte to arrive at Dharapani. Overnight stay at a lodge at Dharapani. As we reach the first hour of the hour, we will be pretty close to getting the initial view of Annapurna II. We will be walking on some steep trails through forests of and some rocky landscapes that run parallel to the Marsayangdi River. The prayer flags can be seen fluttering as we get the unique setting of Tibetan villages as we enter Chame. Overnight stay at a lodge at Chame. Along the narrow steep trail, we will make our way to Pisang. The trail is through dense pine forests along the Marsayangdi River. We will be able to see beautiful apple orchards and small tea shops in the stone houses. We will cross a suspension bridge and get a view of the Pisang Peak (6091m) and other ranges of the Himalayas. Overnight stay at a lodge at Lower Pisang. We will continue to ascend today to the village of Manang. We will notice a change in the scenery as this landscape becomes drier. We will also see fields of various crops swaying to the wind, and also witness Yaks grazing on the pasturelands. We can sense strong Buddhist faith in the area as the village welcomes us with a fair number of monasteries. Overnight stay at a lodge at Manang. Acclimatization is key for successful completion of any trek. We will stay in Manang today and explore the surrounding areas. We will spend the day strolling around the village and take short hikes enjoying gorgeous landscapes. The village is a beautiful treat and has a cluster of flat-roofed stone houses. The Chulu East (6429m), Chulu West (6,419m), Annapurna III (7,555m), and Gangapurna (7,454m) can be seen from the village. Overnight stay at a lodge at Manang. The road to Tilicho also parts its way from Manang. We will have a slow and steady ascent with beautiful views with delightful geography. This region is well known for its beauty and the diversity in culture. On the way, we will Ghunsang and cross Ghyangchang River to reach a monastery. Moving ahead, we can see the pasturelands marking the arrival at Yak Kharka. Overnight stay at a lodge at Yak Kharka. 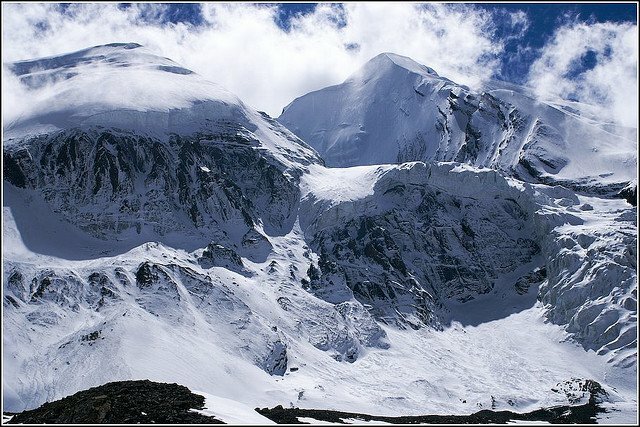 Today, we will reach Thorong Phedi which is situated at an altitude of 4,525m. Thorong Phedi is located at the base of the Thorong La pass (5416m) and has some decent guesthouses. Our trail runs along the Kone River and continues towards Thorong Phedi after crossing it. Here, we can find many trekkers from all over the world which is a good place for conversations and experience sharing. 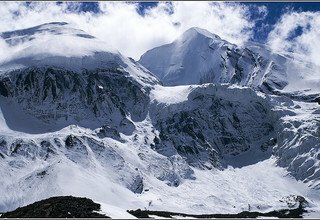 Today we will reach Thorung la which is a famous pass and will begin the ascent early in the morning to avoid strong winds. The pass is wide making it relatively easy to walk on but the journey can get challenging due to the unpredictable weather changes and is almost impossible to pass during winter. 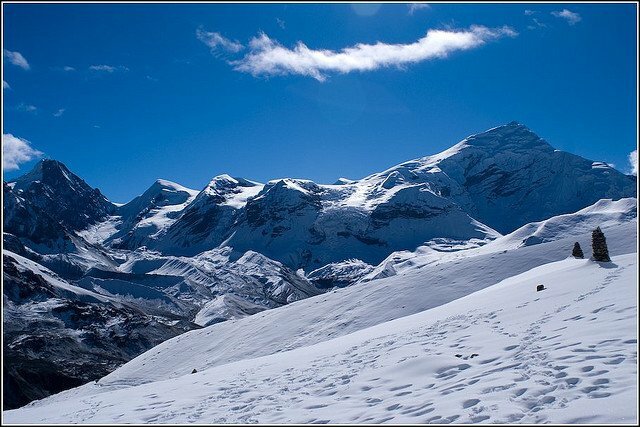 The pass is also the world’s biggest pass and offers great views of the Annapurna massif. Overnight stay at a tented camp at Thorong La. Today we will spend here to prepare for the climb. We will be briefed by the climbing experts on the do’s and don’ts for a successful safe climb. We will explore the surrounding area with the magnificent view in anticipation of tomorrow. We also learn to use the climbing gears as we acclimatize better to the Himalayan atmosphere. Overnight at a tented camp. We will start climbing early so that the winds won’t affect us as much. As we begin the steep climb, we will be able to see the Kali Gandaki valley. As we reach the top, we will be blessed with the magnificent views of Dhaulagiri and Annapurna ranges. This is a great time to rejoice on the views of the Himalayas and also a great spot for photography. From here, we will make our way down a steep cliff to the small town of Muktinath. Overnight stay at a lodge at Muktinath. This day is kept as a backup to attempt climbing the Peak if we are hindered by any unforeseen events on the previous day and move on to Muktinath today. 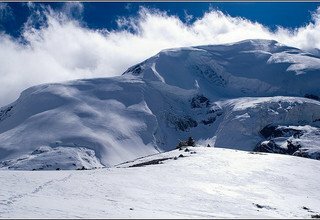 Since the weather at high altitudes can change and worsen in a short period of time, we reserve this day as a contingency. Mostly following a downhill trail, today, we will walk on the windy terrain. We also visit the temple of Muktinath which is one of the most famous pilgrimage sites for Hindus. The temple has 108 taps around it where people take baths before performing various rituals. We can see far villages and silhouettes of mountains and small meadows along the path. There are small houses along the way which provide tea with the breathtaking view. Crossing small streams, we will enter Kagbeni. Overnight stay at a lodge at Kagbeni. Today marks the last day of walking. A relatively flat trail, these will take you through the beautiful drastic scenery of brown, white and grey and walk along the Kaligandaki River. We will see a few suspension bridges, laden with prayer flags with the Nilgiri as the background. Before entering Jomsom, we will cross a wooden bridge and walk on the path lined with apple trees. Overnight stay at a lodge at Jomsom. Day 17: Fly from Jomsom to Pokhara 820m/40minutes and transfer to Hotel. We will take a flight early in the morning. Strong winds forbid taking flights in the later part of the day. If the flights do get canceled or delay, although rare, we have alternatives in place but the extra charges have to be paid by you. We will fly over an immensely drastic landscape in the region. Upon reaching Pokhara, we can take a boat ride on the Phewa Lake with the breathtaking view of the beautiful Machhapuchhre (6997m). In the evening, we can enjoy at the lakeside restaurants to celebrate the successful completion of the climb. Overnight stay at a 3-star hotel in Pokhara. Day 18: Fly from Pokhara to Kathmandu and transfer to Hotel. With the beautiful Himalayas and the view of the striking landscapes, we will take a flight to Kathmandu today. This is a short flight and will save us a lot of time. You can explore local markets and buy souvenirs today. You can also opt to rest in the hotel on the final day of your stay in the country. Overnight stay at a 3-star hotel in Kathmandu. Day 19: Final Departure to International Airport. Today marks the end of your journey. You will be accompanied by one of our representatives to the airport for your departure flight. May you have a good journey and hope to see you again! * 5 nights accommodation with breakfast at 3*** hotel in Kathmandu and Standard hotel in Pokhara. * Kathmandu city/sightseeing tour as per the above itinerary. * Tented accommodation on sharing basis during the trek and climbing period. * Any meals ( Lunch and Dinner)in Kathmandu and Pokhara other than breakfast.